The Leroy Anderson Foundation is very pleased to support the music programs at the Southbury Public Library in Southbury, Connecticut. Shirley Michaels, Chairman of the Southbury Library Board of Directors, has announced that the library will expand their program of musical performances for the public starting in Fall 2010, thanks to a donation from the Leroy Anderson Foundation. The Southbury Library will present a series of concerts from September 2010 through May 2011, culminating with a celebration marking the 5th anniversary of the library's new home on Poverty Road. Shirley Michaels, Chairman of the Southbury Library Board of Directors, made the announcement of the expanded music programs along with Rolf Anderson, a son of the late composer, at a reception held at the library on Monday, June 28, 2010. The invited guests enjoyed a performance of some of Leroy Anderson's music. Violinist Alyce Cognetta Bertz, concertmaster of the Waterbury Symphony Orchestra, and Pianist Susan Theodos performed several of Mr. Anderson's pieces which the composer arranged himself for violin and piano. It was exceedingly well received by those in attendance, because of the excellent acoustics in the Brinker Fireplace Room. "The Southbury Library is very pleased to have the support of the Leroy Anderson Foundation in expanding the music program at the library," said Shirley Michaels. "People have been asking the library to expand the concert programs for several years and we are very excited to be able to present a 'series of concerts' at the Southbury Public Library." The Leroy Anderson Foundation was established by Mrs. Eleanor Anderson to honor her late husband, the well known composer of such familiar compositions as Sleigh Ride, Blue Tango, The Typewriter, The Syncopated Clock, Bugler's Holiday and Fiddle Faddle. 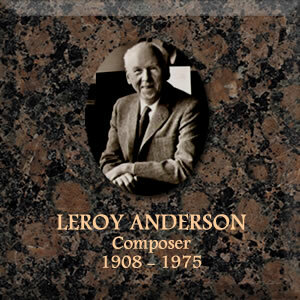 Through the Leroy Anderson Foundation the Anderson family plans to help more people learn about this great American composer and to support music and music education. The performances at the Southbury Public Library will be open to the public. Admission will be free of charge. The Friends of the Southbury Library invite the public to join in supporting this concert series.